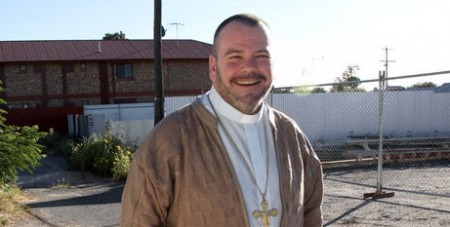 One of the main things that has struck me during the Year of Mercy is the way that the message of Mercy connects with the everyday lives of people, writes the Bishop of Wilcannia-Forbes, Columba Macbeth-Green OSPPE. In many of our schools there is a program called Making Jesus Real. It focuses on bringing the theological understanding of Jesus Christ, Our Redeemer, into a practical connection with children. Children in our schools are encouraged to consciously bring Jesus right into the centre of their lives. They are encouraged to wonder, in many of the moments of their ordinary day: What would Jesus do? The result is that Jesus becomes a “real” and very practical part of a student’s day. A connection is made between Our Lord and the young student that is both tangible and transforming. I think the message of Mercy that the Holy Father has asked us to share during this Year of Mercy is very much about bringing Jesus right into the heart of all we do. We are called to consciously make Jesus a real presence in every ordinary moment of our day. I was blessed this year to be able to accompany 40 pilgrims from my Diocese to World Youth Day, whose theme was: “Blessed are the Merciful”. Naturally, there was a great emphasis on the theme and experience of Mercy in our lives. Those who travelled with me have come home with some powerful stories to tell of their experiences of Mercy on this wonderful pilgrimage. Cardinal Dolan from New York inspired many with his reflections on Mercy and encouraged us all to: "Receive God’s Mercy, be Merciful to others, and importantly, be merciful with ourselves." To receive God’s Mercy we need to know and believe that God is loving and Merciful and wants to shower us with that love. On our part we must be humble enough to admit we need God’s Mercy and humble enough to believe that God wants to give us this gift, through the Church and in particular through the Sacraments. Being merciful to others is Making Jesus Real. It is to apply the criterion – What would Jesus do, in this situation, for that person and for me? What would Jesus say to me? How might I be Christ in this moment for someone else? A smile to someone who looks stressed, a prayer for someone who has hurt me, spending time to listen to someone ‘vent’, being gentle and forgiving of my own mistakes, are all ways we can show Mercy. These are all ways we can be Christ for others and for ourselves. I would say that for many people, being merciful to oneself is probably the hardest thing to do. To believe with all our heart that God loves us and will never turn His back on us, that there is nothing one can do that can’t be forgiven, that when God forgives it is real, is to believe in a marvellously powerful and transforming reality. We need first, however, to forgive ourselves and never say that our own personal sins are greater than God’s Mercy for us. We need to remember that no matter the state of our lives, our mistakes, our misery, our feelings of helplessness, our feelings of being unwanted and unloved, that the reality of God’s longing and love for us is constant and true. We need to try to remember that we are always precious to God, no matter what. God is always waiting for us, always longing to forgive, to heal and to give us rest. I have already seen many graces given and received during this year of Mercy, my prayer is that the Church’s focus on Mercy continues well after the Jubilee Year has ended and that we might truly begin to know the extraordinary power of love that is ours to experience fully through the great Mercy of God.